Boyce Precision Engineering has officially opened its new manufacturing facility and announced plans to almost double its workforce as part of a £6.9 million investment. The company has built a new facility at Charlestown Road Industrial Estate in Portadown on a site purchased from Invest Northern Ireland. The investment is part of a five year project to increase its workforce, manufacturing capabilities, and grow international sales. 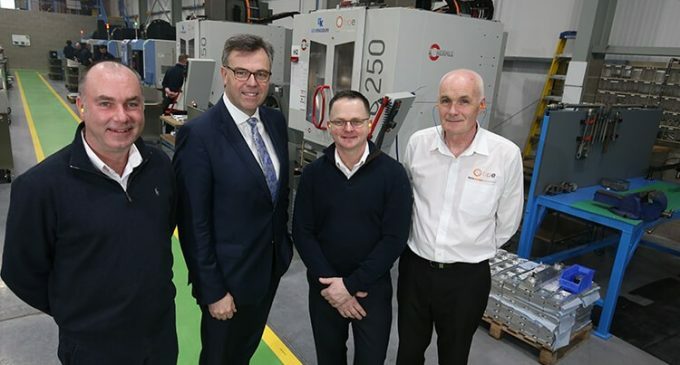 Pictured (L-R) are: George Boyce, Director, BPE; with Alastair Hamilton, CEO, Invest NI; Brian Boyce, Director, BPE; and Brian Perry, Operations Manager, BPE.